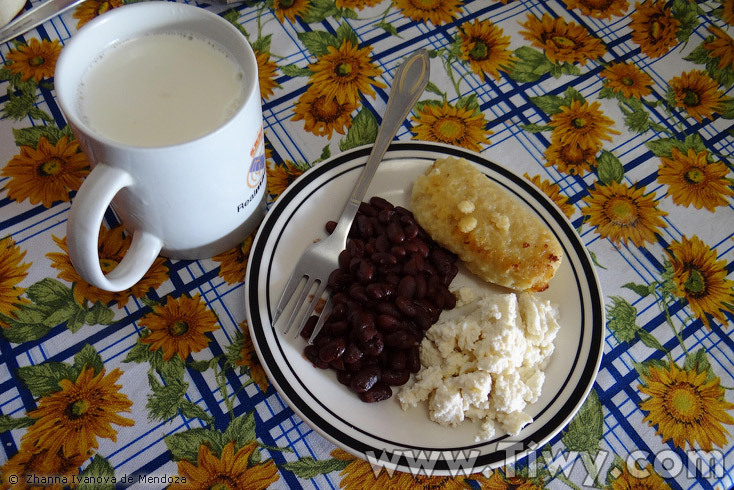 Food – this is one of those topics, on which any self-respecting Salvadoran can talk endlessly. Even the Salvadorans often joke that the food – it's their favorite sport and entertainment, in which they have no match. It is worth mentioning that the Salvadoran cuisine is not something particularly exquisite or exotic. On the contrary. Many traditional dishes are rather simple, both in composition and in the preparation, but, nevertheless, their charming plainness, originality and unusual taste, no doubt, is a matter of national pride of the Salvadorans. Talk about a Salvadoran cuisine is definitely worth starting with the main traditional dish – pupusas, which is a small cake made of corn or rice flour. Filling can be both widespread – cheese, beans, pork, pumpkin, and quite unusual combination like shrimp, fish, wood mushrooms and radishes. 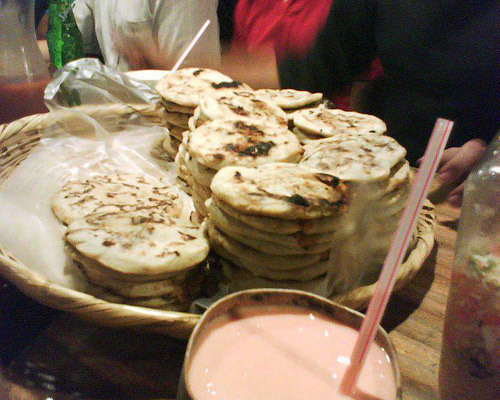 Traditionally cooked pupusas is made in a clay hearth – comal. The pupusas are taken by hands, seasoning them with hot tomato sauce and sauerkraut. Despite the fact that the pupusas are common in neighboring countries (anthropologists have not come to a consensus about the "homeland" of the dish), universal love and the status of national heritage they received in particular in El Salvador. On 1 April 2005 a decree was issued, under which the second Sunday of November has been officially called the "Day of pupusas." The Ministry of Culture is constantly organizing various events – folk festivals, panel discussions, presentations devoted to this dish. In 2007, in one of such competitions in El Salvador, they cooked the pupusa, which ranked in the Guinness Book of Records as "the biggest pupusa." In diameter this wonder-pupusa was 3 m 15 cm; in its preparation they used 200 pounds (about 91 kg) of flour, 40 pounds (18 kilograms) of cheese and just as much pork. About 50 people took part in its preparation. 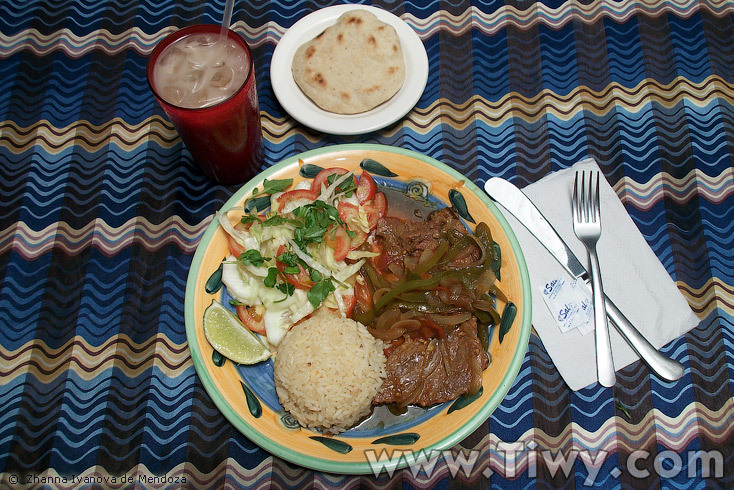 It is not difficult to guess that the Salvadoran cuisine was formed under the influence of Indian culinary traditions. 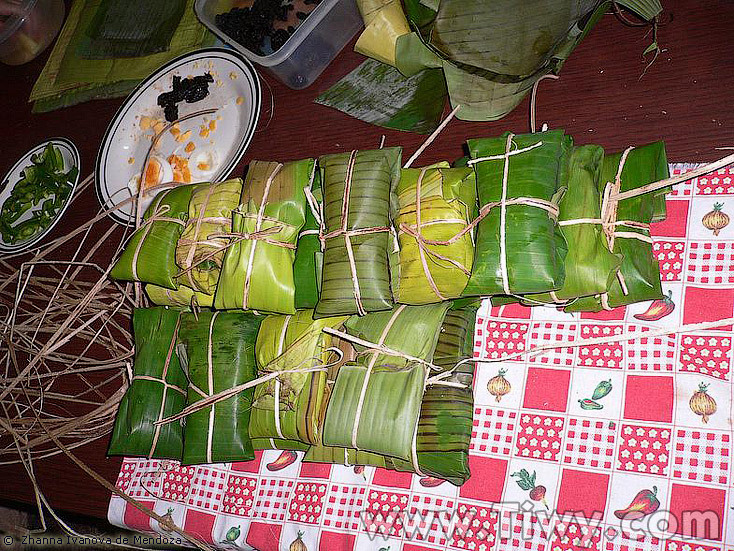 Native Indian heritage is the most favorite Salvadorans tamales – a dish of corn dough, which in the process of cooking is wrapped in banana leaves envelopes. The envelopes are tied with a special rope, made from plant fibers, produced from mangrove swamps. There are many varieties of tamales, differing by the type of filling, on which, in turn, depends the shape of banana leaf. Pork, eggs, fragrant herb chipilin, prunes, raisins and cheese can act as the filling. Tamales pisques are stuffed with brown beans, tamales ticucos – with white. Tamales made of young tender Indian corn are sweet in taste. 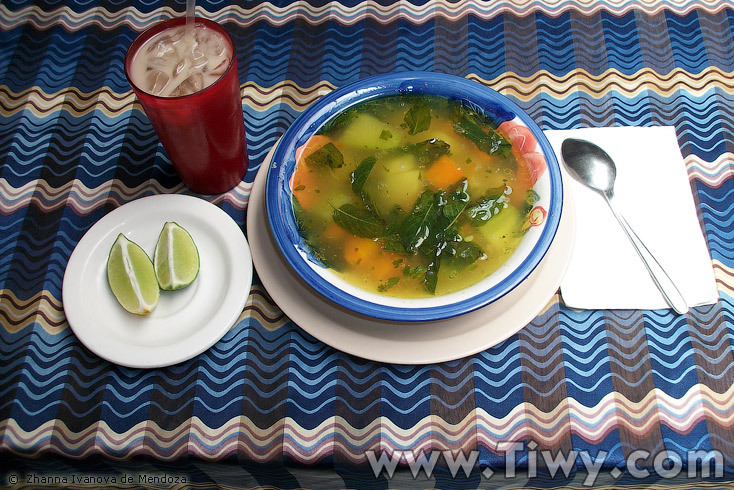 One of the features of Salvadoran cuisine is a wide variety of soups, which are always prepared on the base of rich meat broth (beef – Sopa de Res, pork ribs – Sopa de Frijoles). Almost all of the broth is obtained by long boiling of bones – a tradition preserved since the colonial times, when the poor peons added to meat leftovers of their hosts a variety of vegetables and root crops (yucca, fresh bananas, camote, corn, zucchini, squash, beans), thereby obtaining the delicious and nutritious meals. 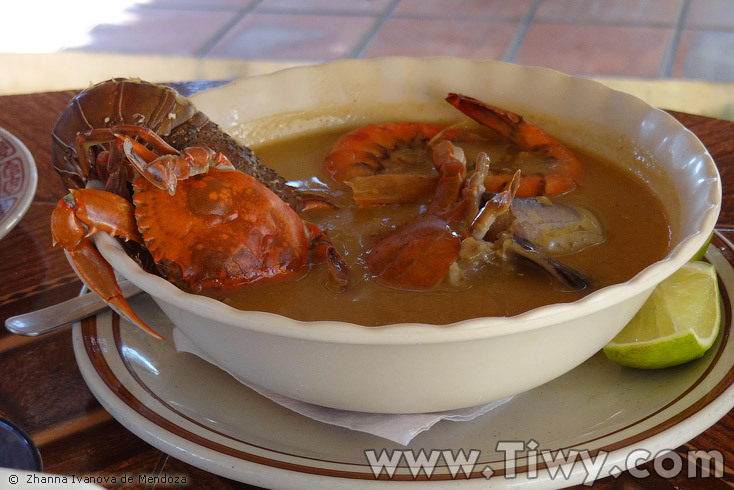 A special case is a well-known mariscada – soup of fish, shrimps, crabs and other seafood. 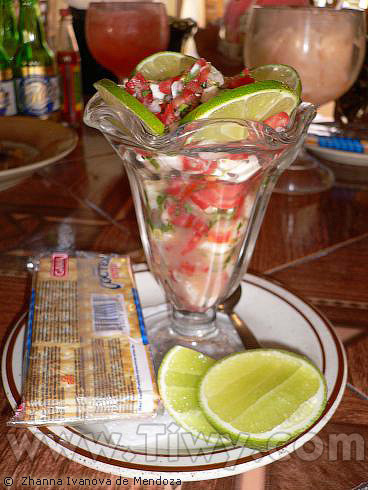 Festive menu of the Salvadorans is worth of separate mentioning. But the most favorite and long-awaited holiday is Christmas, under the influence of the United States, there is a tradition to have stuffed turkey. At New Year chicken under a variety of sauces, including on the basis of local beer or alcoholic drink chicha can be a decoration of the table. 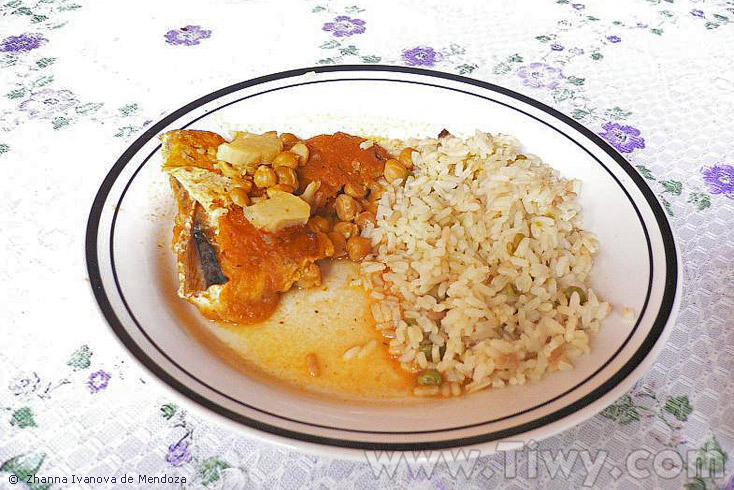 In Lent the main dish is pescado seco – dried fish in egg with tomato sauce. During the Holy Week, it is customary to keep handy different snacks – sandwiches, cakes, hot chocolate and coffee. Since many are involved in religious processions, nobody has any special time for cooking. 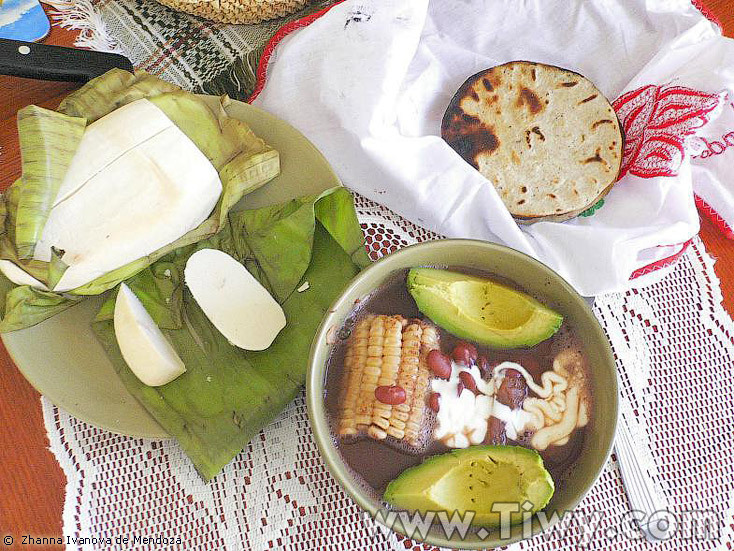 During this period, you can also try a traditional Salvadoran corn-based drink – chilate. A kind of jam on the basis of local exotic fruits can smooth out the specific flavor of this dish. During numerous fairs and festivals one can enjoy Salvadoran snack: donuts sprinkled with powdered sugar churros, corn and banana chips, apples in caramel. Particularly attractive, both for the Salvadorans, and tourists will certainly be the tables, bursting with various Salvadoran sweets – all kinds of aromatic pellets, candied fruit, nuts, jelly, etc. It should be noted that the Salvadorans are big fans of any "street" food. At any time of the day on the streets, in parks and squares one can see a large number of merchants offering a variety of dishes. Particularly popular are the dishes made of corn, cooked in various ways (roasted over charcoal with lemon, sweet corn fritters riguas, etc. ), fried in lots of oil hot meat pies or "crazy corn" (elote loco) with ketchup, mayonnaise and cheese. Lovers of adrenaline buzz can visit specially arranged exotic food festivals, where one can try different food, such as frogs meat, iguana soup or local rodents. On the beaches and in restaurants it is certainly worth trying cocktails made of fresh shrimps, oysters and mussels, fried grilled fish - boca colorada. In everyday life, the Salvadorans are quite unpretentious. 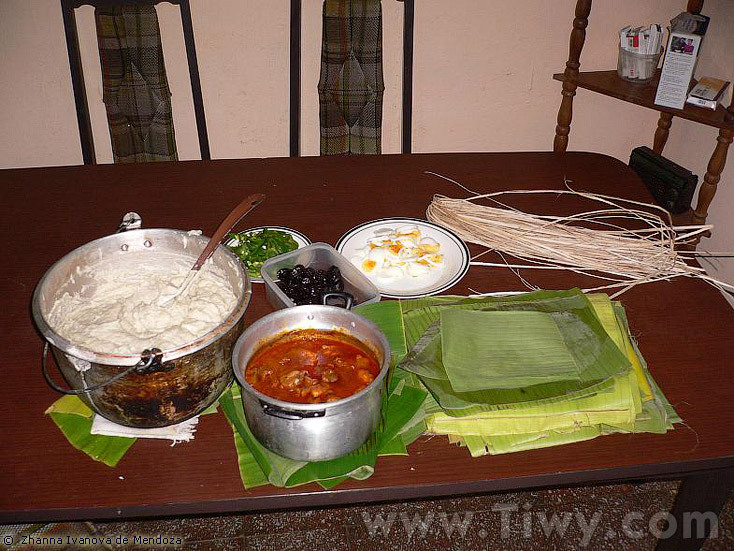 The basis of the diet is rice, beans, local white cheese of different varieties, corn pones, tortillas. Dishes made of different varieties of bananas, of which they cook very tasty and flavorful desserts, are enjoyed very much by population. In the evening it is customary to have coffee with fresh cakes and pastries. Among the drinks the Salvadorans prefer coffee, hot chocolate, soft drinks of various fruits, horchata. There is a variety of drinks based on corn: in addition to the already mentioned chilate, sweet atol and spicy-salty atol shuco, where they also add beans are in great demand. A typical lunch that can be found in local eateries. To summarize, we can say that in El Salvador, for sure, everyone will find something to taste – be it traditional local dishes, a wide variety of fresh vegetables and exotic fruits or fresh fish and seafood. The Salvadorans are so creative that they use their national flower as food. Believe me, they are sure to find something to surprise you.